Looking for a Perfect Bed? You are at the right place and in Safe Hands! Beautifully handmade double bed frame in Velvet with diamond and is also made of cube upholstery. We have various size and various fabrics and colours direct from factory. As with all our beds the frame is made from solid wood, built to last a lifetime. Solid wooden slats and middle support ensure adequate support is given to the mattress. Each one of our beds is painstakingly hand made here in the UK using traditional methods. We use truly bespoke manufacturers so you can tweak this design to your requirements in terms of colours, fabric, buttons, height and size just let us know. 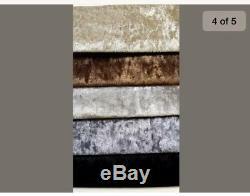 This bed frame is made from high quality FR Treated crushed velvet material. Will breathe new life into your bedroom. 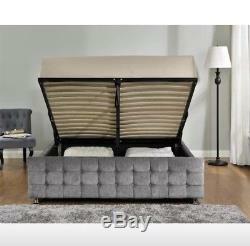 And has a solid wooden slatted base for extremely strong yet comfortable sleeping experience. With a generous storage depth of 20cm, this spacious ottoman provides plenty of room for storing your belongings. A gas-assisted lift system makes easy work of opening and closing the ottoman base, doing all of the hard work for you. Snuggle Beds have fitted the Eleanor with a sprung slatted base to better support your mattress and deliver greater comfort. AVAILABLE IN ALL SIZES AND RANGE OF COLOURS Available in a range of sizes, this bed frame will make an amazing addition to any room. This listing is for the bed frame only. Upholstered In a variety of materials and colours Chrome Legs as standard High Quality Thick Foam Backing Diamante Crystals Brackets & Screws are included and are very simple to put together. With an easy grip handle and a smooth lifting mechanism. The front opening ottoman allows you to store away items such as clothes, shoes, bedding creating much needed space. All our beds fit standard British size mattresses. This bed frame is made from high quality FR Treated crushed velvet material and has a solid wooden slatted base for extremely strong yet comfortable sleeping experience. Available in a range of sizes, this bed frame will make an amazing addition to any room. If you reside in the following area. West Yorkshire, Dewsbury, Huddersfield, cleckheaton, Leeds, Bradford, Wakefield, Batley, birstall, denby dale, heckmondwike, midfield and local area surrounding areas. For the item to be delivered however it will at an extra cost. 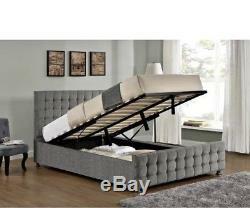 Please Note: Deliveries are to the ground floor only, the Bed comes Flat Packed and will require assembly with no effort. The sizes are all approximate and can vary by a few cm, as these beds are all handmade. Please accept our apologies in advance as its purely in the hands of the couriers, however 99% of the deliveries are within one day. IMPORTANT INFORMATION - Please Read Carefully. Any amendments required should be notified immediately. PLEASE NOTE THE COLOUR SWATCHES ARE STUDIO IMAGES AND THE ACTUAL SHADE OF THE FABRIC CAN VARY DUE TO LIGHTING AND SHADE. All Goods leaving the factory are checked for any damages and are therefore the responsibility of the Courier company but to claim this off the courier we need a proof. We thank you in advance for your support and understanding and can assure you of our full attention in resolving any matter that might arise. To place the order for your specific choice of colour or size, Or if you cant Find what you are looking for. The item "Ottoman Beds in Cube upholstery crushed velvet with crystal diamond bed frame" is in sale since Wednesday, January 17, 2018. 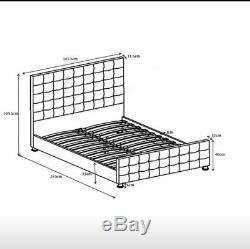 This item is in the category "Home, Furniture & DIY\Furniture\Beds & Mattresses\Other Beds & Mattresses". 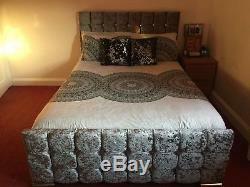 The seller is "sj_dream_beds" and is located in Dewsbury. This item can be shipped to United Kingdom.